The Anaheim Chili Pepper was named after the city of Anaheim in California, but it actually originated in New Mexico, where it is still primarily grown and eaten today. This is why it belongs to the New Mexican (or Numex) family of chili pepper varieties and is the family’s most-famous representative. The large, elongated, thick-walled peppers stay green for quite a long time before ripening to red, they have a mild, aromatic spicy heat. In New Mexico, they are often eaten whilst still green (e.g. 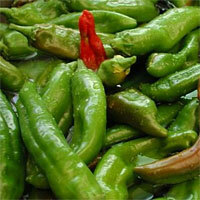 for chiles rellenos), where they are first grilled and then skinned, giving them their distinctive flavour. When the pepper have ripened to red and are dried, they turn into a dark burgundy color. They have a mildly pungeant chili flavour. They are an excellent compliment to the Tex Mex cuisine, to egg dishes, soups, stews, and vegetable dishes.